Product #18326 | SKU VAL-4SI | 0.0 (no ratings yet) Thanks for your rating! 4-Channel Simultaneous Charging, Plus 4-Channel Expansion Charging. 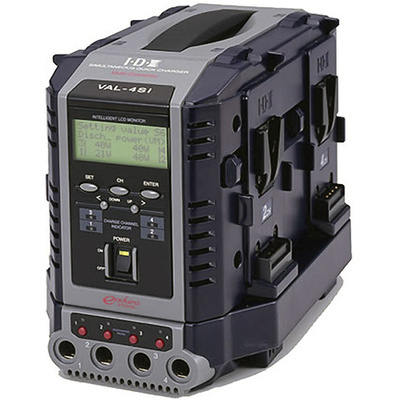 The IDX VAL-4SI is a four-channel, simultaneous Li-Ion (Lithium-Ion) fast charger. Up to four Li-Ion Endura V-mount batteries can be charged in 2.5 hours or less. The VAL series allows the expansion to charge 4 more Endura batteries utilizing the supplied cables. This model has the ability to offer information for PC retrieval. The VAL-4S offers a lightweight design with a convenient built-in handle. The highly reliable V-Mount, battery mount is becoming more and more prevalent on many new broadcast and professional camcorders. As with all IDX chargers, the VAL-4S's power switch is recessed to prevent an accidental loss of power. A world-wide, auto-sensing AC power (AC 100-240V) operation is standard. The VAL series expands to a second bank of Endura battery charging; it utilizes supplied cables to allow 8 batteries to be charged. The first four charge simultaneously, when finished the second set of four charge simultaneously. Via a USB port, this model allows the user to retrieve charging infromation for PC viewing and storage. 6.3 x 11.3 x 6.02"